This is probably the most important part of my evaluation. How the program fared in this area really impacted my decision to continue evaluating it or move on to the next one. For this section, I did go back (after choosing my favorite) and work with each of them to try to include similar information for each one. I figured the extra effort would be a little more useful than just putting “I didn’t like it”. 🙂 So, if it seems like there isn’t as much information for a program, or if I have something incorrect (sorry), it’s probably because I didn’t spend as much time with that application. 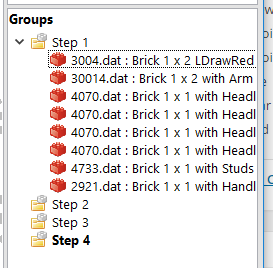 After selecting a part in JBrickBuilder you can use the arrow keys to orient it, a lot like LDD. 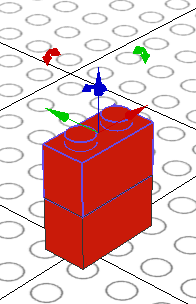 Similar to LDD, parts snap to a build plane and you have to build up/down from there. The plane does not automatically adjust up if parts get added below the build plane. Once you get the part in position you just left-click and the part will stay. The next part you pull out will assume the same orientation of the last, or currently, selected part, which can be good and bad. Part snapping works relatively well, but I didn’t spend much time building because I couldn’t figure out how to move parts once they were placed. Clicking on them and then trying to drag them didn’t do anything. I didn’t see any kind of move button either. In my brief try to figure out how to move parts in the build area, I couldn’t find a way. The only way to really “move” parts is to use Ctrl+x to cut the part and then use Ctrl+v to paste it so that you can then move it to the position you want. I had to post on the LDraw forums to figure this out. This was not a very effective, or easy to figure out, way to “move” parts. Right-clicking on parts seemed to only center on that part. I was hoping there would be some other options, but there weren’t. Even though I couldn’t move parts, I did see that there was a button you could press to rotate them. 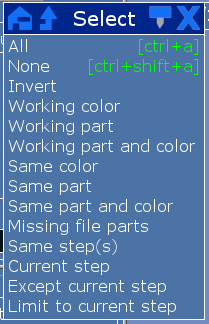 After clicking the “Rotate tool” button and selecting a part I could rotate it, sort of. I could only rotate parts around the Y-axis, but couldn’t figure out how to rotate around another axis. 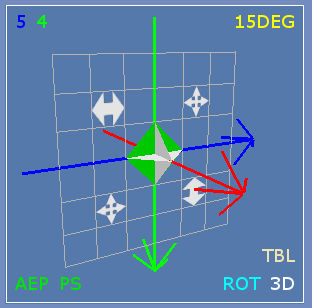 Once you selected the part to rotate, you also had the option to manually the rotation value. Selecting multiple parts is done by left-clicking and dragging a box around the parts you want to select and/or holding down Ctrl and left-clicking on the parts you want to select. Pretty standard. There doesn’t seem to be a way to create groups (there might be though). Ctrl+z will undo actions and Ctrl+y will redo actions. 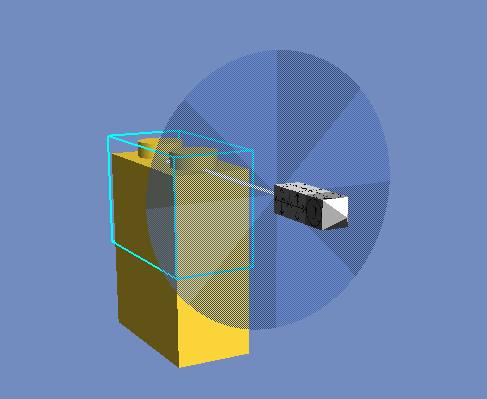 Right-Click and move rotates the camera around. However, sometimes I found it difficult to get the view I wanted when rotating the camera around. Summary: I wasn’t too impressed with how JBrickBuilder’s build area functioned and wasn’t drawn to it given the other options available. Because of that I didn’t spend much time with it. LDCad’s build area doesn’t have a build plane like LDD, LeoCad and JBrickBuilder do. It has a wide open area where you can put parts wherever you want. Dragging parts out was easy, just find and drag out. Knowing certain shortcuts (see Adding Parts section) made it relatively quick and easy to start building. The next part you pull out will assume the same orientation of the last, or currently, selected part, which can be good and bad. Moving parts around, once in the build area, was very easy, just drag it where you want it. You might have to rotate the camera around to drag it in the desired direction, but it was pretty easy. There’s also an editing pin that you can use to move and rotate the part or change the part’s center. The pin will change orientation based on the camera view. After learning that you can press “f” (front), “s” (side), or “t” (top) to re-orient the pin, without changing the camera view, things became much easier. Part snapping is still in the works (not all parts work), but what worked made building really easy and it worked really well. Part snapping isn’t enabled by default, so don’t forget to turn it on (hover over the compass and hit “GS” so that it changes to “PS”, more on the compass later). Selecting multiple parts was a little annoying, I always wanted to try and left-click and drag the mouse to select a group of parts and that would only change the view. You can’t left-click and drag to select multiple parts. To select more than one part you have to select one first, and then hold down Ctrl while you left-click the other parts. This can be a bit tedious if you have a complex group (I guess you could start grouping stuff early on and then keep adding). However, there is a pretty handy little select menu that has quite a few options to help you select parts (see screenshot below). 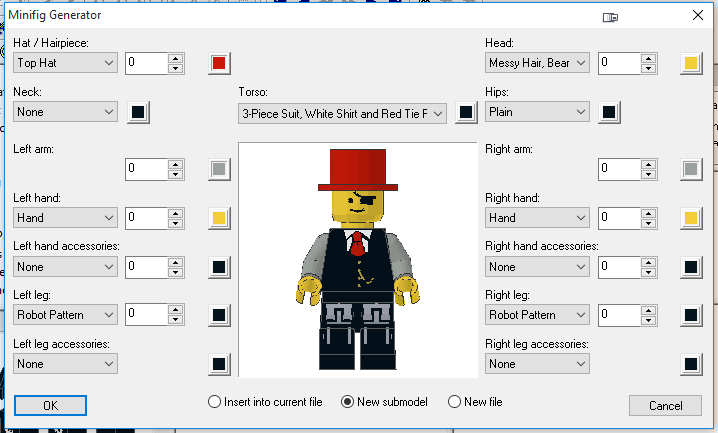 One thing that I really like from LDD and SR 3D Builder, and didn’t see in any of the other programs, was the ability to select all parts connected to the current selected part. This option comes in handy when creating groups and it would be a welcome addition for all the programs. Creating groups was rather easy (selecting multiple parts aside): select the parts you want and then press Ctrl+g. Parts will stay grouped and you can move them around as one part. One other neat trick is that of pressing “o”. If you’re having problems lining up or positioning a piece that’s at weird angles, press “o” and it will change the grid orientation to match the current selection’s main part. Or, if nothing is selected it will reset to the absolute grid. This comes in really handy. Ctrl+z will undo actions and Ctrl+Shift+z will redo actions. Selecting a part and pressing Insert will copy it, as will Ctrl+c and Ctrl+v. You can easily use this to pan/rotate the camera and get to certain options (e.g. grid spacing size, enable part snapping (the “PS”, which isn’t on by default), default rotation stepping, 2D or 3D view, trackball/spin camera, etc.). It’s pretty useful in many ways. LDCad uses trackball rotation by default which means the starting location of the mouse click will influence how things rotate. The easiest way to visualize this is by imagining a big beach ball inside the editing area. If you ‘grab’ it at the left center and move to the right it will spin left ot right, but if you grab it bottom left and move to the top right it will spin diagonally and so on. Many people don’t really like the trackball method, it is therefore possible to set rotation control to the more beginner friendly spin method discussed below in the compass chapter. But please don’t give up too quickly as you might learn to love the trackball method if given enough time to master it. Another nice little trick is pressing “v” to toggle between the 3D and the 2D view. Once in the 2D view you can press “t”, “f” or “s” to view the top, front or side, respectively. It’s nice to quickly be able to switch between these views to position parts. Summary: Until I figured out some of the shortcuts that were available, I wasn’t sure I liked how to move parts around. After I figured them out I really started liking this a lot more than some of the others. I also loved how you can easily setup multiple views and quickly switch between 3D and 2D views. Moving and positioning parts is easy to do, just drag a part onto the build area, use the arrow keys to orient it and then left-click to place the part. At one point I thought the next part you pulled out would assume the same orientation as the last part you moved, but I tried again and it didn’t seem to do that. Not sure what happened there. Parts will automatically snap into place when dragged close to another part. However, sometimes I had a little difficulty connecting parts if they were off-centered or at certain angles. Building, you start from a plane and build up, which I thought was a little strange. You don’t have the ability to position the part just anywhere along the Y-axis, when you drag parts out they automatically align with the plane and will snap to other parts when you get close to them. If you snap to the bottom of a part that’s already aligned to the building plane it moves the building plane down. Multiple Selection tool – when activated you just left-click all the parts you want to select, not need to hold down Ctrl. Connected Selection tool – when activated, selects all parts connected to the part you select. I found this a really handy way to select parts and wished it was in all the other programs. SR 3D Builder was the only other program that had this option. Color Selection tool – when activated, selects all parts on the screen of the same color you select. Shape Selection tool – when activated, selects all parts on the screen of the same shape you select. Color and Shape Selection tool – when activated, selects all parts on the screen of the same shape and same color of the part you select. The selection options make it really easy to group parts together. Select the parts you want to group and then press Ctrl+g. Groups then show up under a Groups tab. Select the group you want to select all the parts for that group, or to add/remove parts to that group (adding/removing parts to an existing group was a little weird though). However, if you move parts from one group to another it will remove them from the first group and you can eventually end up with groups with no parts in them. Thought it was a little strange that it didn’t remove empty groups automatically. Sometimes I had quite a few empty groups to delete until I figured out how it worked. Rotating parts anything other than 90 degrees is a little weird. In order to do this the part has to be connected to something that will actually allow it to rotate. Then you can use the Hinge tool to rotate the part however you want. If you think about it it kind of makes sense, but it was quite different compared to all the other programs in how it handled rotations. There didn’t seem to be any way to create multiple views or go to any kind of 2D view. Ctrl+c and Ctrl+v worked like a charm for copying and pasting selected parts. Summary: A relatively easy to use program with excellent part snapping. Aside from the building plane base being a little weird to me, building was rather easy and straight forward. LDD was one of the top contenders after playing with it for a little while. 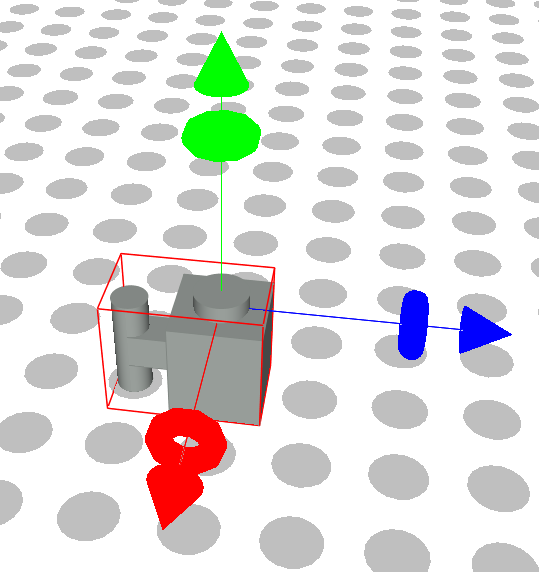 Rotating parts is similar to moving them, there are little arrows, indicating direction, that you can click to rotate the part (see picture above). Depending on the camera orientation it can be difficult to get the correct rotation because it can jump past the desired position. Selecting parts is pretty easy, you can left-click and drag a box around the parts you want to select and/or Ctrl+Left-click to select what you want. You also have the following options from the Edit menu: Select All, Select None, Select Invert and Select by Name…. Creating a group from selected parts is easy too. Ctrl+g will bring up a dialog to name the group and then it will create the group. Not sure where or why it saves the group name or what it does with it, but it creates a group and the parts will now stay together. 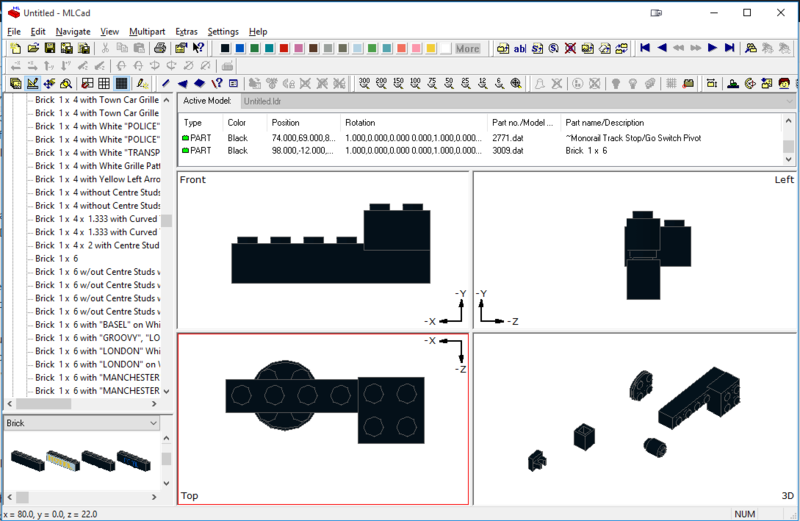 LeoCAD has a Find option that appears to be related to finding parts in the build area related to your model. However, it didn’t seem to work correctly. When I specified a specific part to find (checked the box next to that option) it did not find it even though it was in the build area. Maybe I was doing something wrong…??? Summary: Program has potential, but the interaction with parts and the interface were not appealing to me. The Minifig Wizard might seal the deal if you do a lot of building with them. MLCad’s build area is different than all the other programs in that it has 4 views by default: top, front, left and 3D. You can easily adjust the size of the views as well as the view angle (e.g. top, bottom, left, right, front, back or 3D), but I didn’t see a way to add or remove views. Once you drag a part out to any 2D view you can then drag it around using the mouse. There doesn’t seem to be much you can do with the 3D view other than rotate it around to view the model. 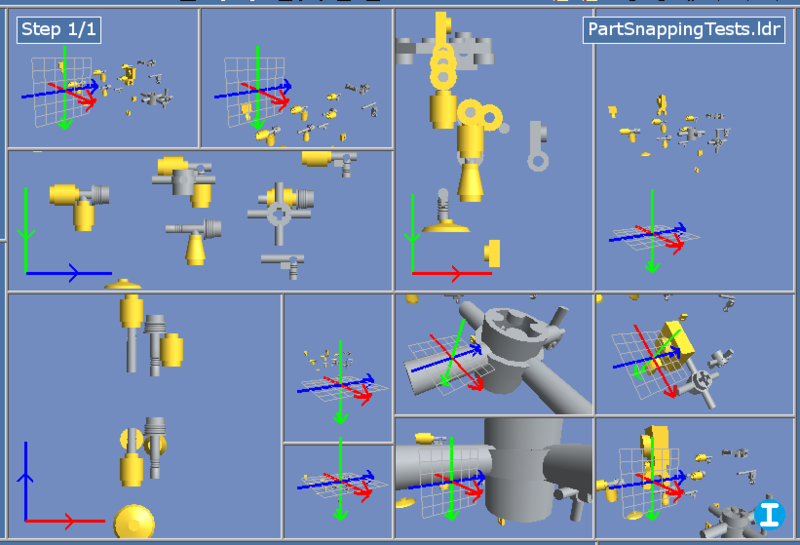 There is no part snapping, so having all of the different views helps align the parts correctly. 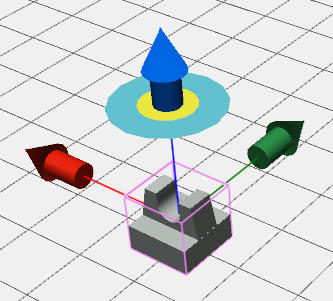 Rotating parts is pretty straight forward and was accomplished by selecting a part and then clicking the appropriate rotate button in the tool bar until the part was in the correct position. You can choose to rotate clockwise or counter-clockwise around any axis. The tool bar has a lot of useful functions, with pretty self-explanatory images, to quickly help you figure out how to do things. Keyboard shortcuts for more of the toolbar buttons would be a welcome change (maybe I missed them…???). Selecting parts is easy, you can just left-click and drag a box around the parts you want to select and/or Ctrl+Left-click to select what you want. You can also Select All, Same Type and Same Color by using Edit > Select. Creating a group from selected parts is easy too. Ctrl+g will bring up a dialog to name the group and then it will create the group. Not sure where or why it saved the group name or what it did with it, but it created a group and the parts will now stay together. Ctrl+z will undo actions but there didn’t seem to be a way to redo actions. Summary: All-in-all, building something wasn’t very difficult, it’s just that lining up parts, when other programs have part snapping, requires more time and effort to build something. MOC Builder’s build area is a lot like LDD, JBrickBuilder and LeoCAD, in that it also has a plane that parts will automatically align with when you pull them out. The plane will not automatically adjust itself if parts are moved below it, which can be a little annoying. Moving parts is easy, just left-click and drag. Sometimes left-clicking on an un-selected part, and sometimes right-clicking on a selected part (didn’t quite figure that out), would bring up some arrows that you can use to move and rotate the part. Selecting multiple parts is really easy, and sometimes annoying. By default (not sure you can change it) just left-clicking on multiple parts selects them. In other words, if you simply left-click on a part and then left-click on another part they will both be selected. This bit me a bunch of times because I would expect that clicking on the second part would deselect the first, which is what happens with most of the other programs. I would then do something to the second part and it would affect both parts. Ctrl+z, click off the parts, to deselect all, click back on just the part I want to manipulate and re-do what I had just done…frustrating. You can also just left-click and drag to select multiple parts. I didn’t see any other options for selecting parts. Part snapping works OK. Sometimes I had problems when pieces were at weird angles or depending on the view and part orientations. I would have to try multiple times just to get parts to snap and it could be frustrating. I did stumble upon the option to Find and/or Replace parts in your model. This could be really useful. Summary: All in all a pretty slick and easy builder with decent part snapping. NOTE: I could not get SR 3D Builder to run on Windows 10 without running the compatibility troubleshooter and setting the compatibility mode to Windows 8. Same thing for Windows 7, I had to run it in compatibility mode for Windows XP SP3 to get it to run on Windows 7. Even then it would crash and didn’t always seem to work correctly. So, with that said, some of the weirdness I experienced could have been due to it not running correctly on Windows 10 or Windows 7. At first I didn’t realize that to get the D-Caddy to stay you had to press Ctrl and then left-click the part. Once you do that the D-Caddy will remain and you can use it to rotate the part. What wasn’t apparent was that if you press Ctrl or Shift while clicking one of the arrows you can move in smaller rotational steps. What I couldn’t figure out was that if I over rotated the part I couldn’t go back, I could only continue to rotate in the initial direction. Ctrl+z would undo the rotation and the last action. I then had to press Ctrl+y again to get it back to where it was before I started to rotate the part and then rotate it again. For whatever reason Ctrl+z would undo my current rotation action, plus the last action. One thing that frustrated me was that if you have a part selected and then try to add a new part it will replace the current, selected part. Once a part is selected you don’t actually need to click on it to move it, clicking anywhere on the build area will actually move the part. Sometimes, with the part selected, I would move the mouse and it would jump to a different location. I didn’t click or anything, and the part would just move, it was a little annoying and I’m not sure why it did that. Part snapping worked pretty well and made it easy to attach parts and build models. Sometimes you’d have to use the mouse wheel to adjust the Y-axis to get parts to snap. Selecting multiple parts is accomplished by using Ctrl+Left-click to select all the parts you want, which can be tedious. You cannot right-click and drag the mouse over multiple parts to select them. There might be a way to do this, but I couldn’t figure it out. You can right-click and get the following select options: Brick, Group, Block, Connected Parts. I wasn’t able to figure out how to group parts in my initial tests. After fiddling around with it later I figured out that if you press Ctrl+g, after selecting the parts you want to group, the Toolbox switches to the Groups tab. From that tab you can then right-click and choose “New Child” to create a new group. I didn’t realize the right-click option was there when I first tried pressing Ctrl+g to create a group. The options (buttons) that are available hint at groups but don’t allow you to create a group. Not to difficult to do once I figured it out. Ctrl+z will undo and Ctrl+y will re-do actions. Summary: Frustrating part management that didn’t always seem to work the same. I really wanted to like this program, but I was having a hard time figuring out how to do the basics. I’m not sure if any of the issues I had were due to OS compatibility issues. This was a tough one, there were several programs that made it pretty easy to add and manipulate parts right out of the gate. Initially I liked LDD, it was simple. However, after spending time with the other programs, LDCad stood out to me and became my favorite. It took a little extra effort to figure out how to more effectively use the LDCad interface and shortcuts, but was well worth it. 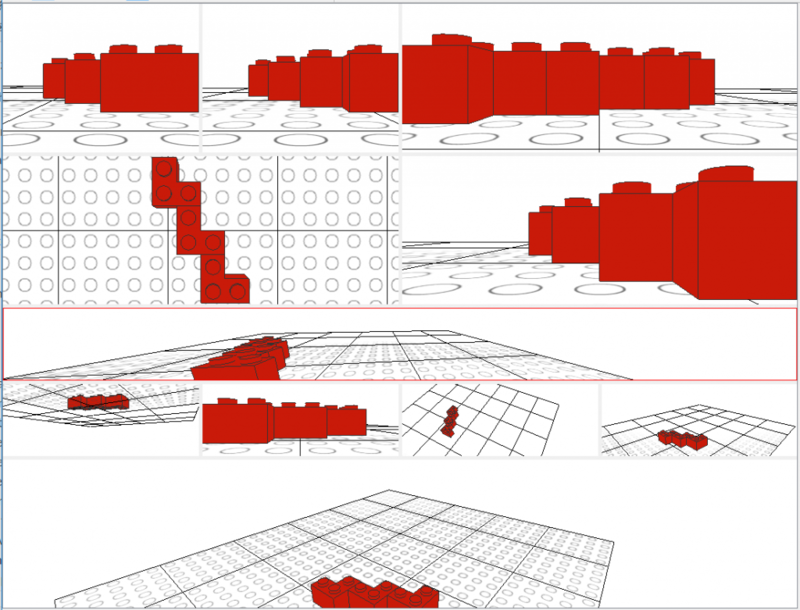 Being able to setup multiple views and quickly toggle between 3D and 2D views was also a big plus for LDCad.